You are familiar with Software Update Manager (SUM), and with it’s version 1.0. As Product Manager for SUM, I want to draw your attention to the fact that we have made SUM 2.0 available in September, as part of Software Logistics Toolset 1.0 SP stack 21. What does that mean for you? SUM 1.0 will still be around, so both SUM 1.0 and 2.0 will be offered in parallel. But each scenario is covered by only one of the SUM versions – the other SUM version will refuse to work on that scenario (“Hey buddy, you are on the wrong side of tools – ask my bro’ for this“). But as Maintenance Planner will anyhow provide to download the adequate version for your scenario, you shouldn’t experience this. Which SUM for which scenario? all System Conversions (transition SAP ERP to SAP S/4HANA) will be done by SUM 2.0. Note that the coding of SUM 2.0 is not greenfield – it is the proven coding of SUM 1.0, but with a slimming cure, as it does not handle all the scenarios that the previous SUM 1.0 was covering. What’s in: Software Logistics Toolset 1.0 SPS 21? Well, let’s turn to the numbers game: the SL Toolset is still 1.0, and SP stack 21 is available since September. SL Toolset 1.0 SPS 21 includes SUM 2.0 SP 0 and SUM 1.0 SP 21. See blog https://blogs.sap.com/?p=545723 on SL Toolset 1.0 SPS 21. Stay tuned for more news with SUM 2.0, as soon as the new kid on the block is available. Q: Is SUM 2.0 part of SUM 1.0? Q: Where do I find SUM 2.0 for downloading? Q: I have used SUM 1.0 SP 20 for a system conversion run towards SAP S/4HANA. Now conversion is only offered with SUM 2.0 – can’t I use SUM 1.0 any longer? A: SUM 1.0 SP 21 can’t be used for a conversion scenario. If you have used SUM 1.0 SP 20 for a conversion until now, the recommendation is to switch to SUM 2.0 SP 00. You may continue to use SUM 1.0 SP 20 for a while, typically 3 months after the next SP is available. This phase is called “patch-on-request”: SUM 1.0 SP 20 is no longer available for download, but patches may be individually provided when required, based on an incident. Check the Maintenance Strategy of the SL Toolset which is attached to the respective SAP note, e.g. SAP Note 2475015 for SL Toolset 1.0 SPS 21. Q: will SUM 2.0 cover the target 7.50 for java source systems in the future? A: No, SUM 2.0 will remain as tool for pure ABAP based source systems. Q: Why is SUM 1.0 offered in two archives: SUM10SP22* and SUM10HDBSP22*? Will SUM 2.0 applicable in DMO as well? yes, sure SUM 2.0 will allow DMO. Thanks for your input. I believe maintenance planner is best judge what SUM version fits in for platform update. Surprisingly we have been reaching out to SAP OSS to get the fix for below known issue in SP20. Its taking little longer then usual, I am sure they will sooner. I spoke to Günther on this matter as well yesterday. 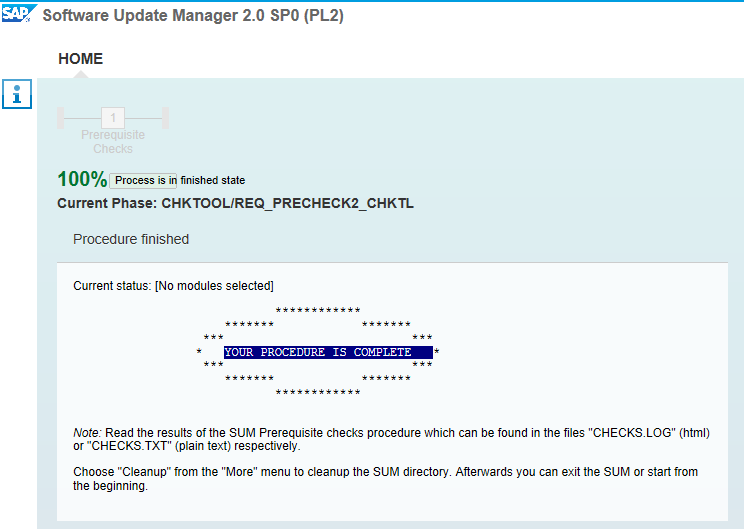 Quick Question here – When SUM SP20 Patch10 is releasing by SAP? During a run with patch level 09 of Software Update Manager 1.0 SP20, phase RUN_RDDIT006 may fail due to a runtime error DDIC_TYPE_REF_ACCESS_ERROR when a shadow table is being accessed. This error is corrected with patch level 10. If you encounter this runtime error before patch level 10 is available, contact the SAP support. as always, we do not announce or predict the availability of any SUM PL, sorry. It depends on various factors like e.g. regression test results. So SUM 1.0 will still cover DB Oracle -> HANA migration only option keeping NW 7.4 as a release? yes, SUM 1.0 will continue to support DMO, in the given boundaries. Will SUM 2.0 is going to offer a better table content comparison mechanism? In SUM 1.0 SP19 we tested this feature and it ran for close 120 hours. we do not have an adaptation of table comparison with SUM 2.0 SP 00.
are there already instructions available, how to apply SUM 2.0 SP02 into SUM 1.0 SP21 (which contains 2.0 SP00) ? Currently I only can guess that after extracting the SAR archive of SUM 1.0 SP21 i need to overwrite the SUM dir with the content of the archive for SUM 2.0 SP02. no overwrite required: you download either SUM 1.0 or SUM 2.0. It is not that one of them contains the other. Let me know if there is a part in my text (or any other) that may have created this impression. thanks a lot for your fast respnse. However, I downloaded SUM 2.0 SP02, extracted it and only found one subdir “abap” in it. No startup program, nothing else. Thats why I came to the conculsion that this could not be a useful standalone archive. Sorry, forgot to mention where I got the conclusion that SUM 1.0 SP21 contains 2.0 SP00. This is what I got from maintenance planner as well. This guide I was unable to find via the well-known paths. We got severe error on SUM 2.0 SP0 PL1 while fixing the minor issue during downtime. Same issue occured in SUM 1.0 PL9, but we able to proceed smoothly on same phase with the same fix applied. Just created an incident with AGS, and waiting for the fix, downtime numbers are manipulated now due to SUM 2.0 issues. SAPup: /bas/749_REL/sapup/src/lmt_020_REL/src/upg/SAPup/SAPupCloneRUN.c:5114: detBucketSizes: Assertion `! ((workTables)->ULDLH_FirstNode == (ul_dllistnode_t *)&((workTables)->ULDLH_Dummy) && (workTables)->ULDLH_LastNode == (ul_dllistnode_t *)&((workTables)->ULDLH_FirstNode))’ failed. *** FATAL: Got signal ‘SIGABRT’ (6)! Please contact the SAP support! *** FATAL: SAPup got signal in phase ‘EU_CLONE_MIG_DT_IMP’, stack trace written to dev_SAPup. EXEC> Process with PID 120326 terminated with status -6 at 20170922060622! not sure why you post this here: the tool has an issue and tells you to contact SAP support, which you did – OK. Sorry that I am not able to contribute anything on that. My bad, actually I should be sorry, it should marked as FYI only. Intention to share with other only. Thanks again for your great blogs, appreciate all your inputs and making this SUM tool far optimized and best interactive tool from all previous tool versions, I still remember R3up days, it was huge challenge doing technical upgrades. Reading this post I think this is a good time to propose a new and important feature for SUM. When using SUM, during the downtime phase (TABIM_UPG to be exact) you can see most of the downtime is importing the SAP_UI package and SPs. The SAP_UI is unique since it is made of a lot of MIME repository objects (SAPUI5 libraries ZIP, JS, HTML, CSS, etc..) which are reimported for every patch and SP. What I suggest is whenever you have multiple SAP_UI packages add a preprocessing phase to build a new package with the latest version of the MIME objects. Then, Import that package somewhere later in the queue. This way fewer objects will be imported and the downtime will decrease a lot (the more packages, the more time we save). Also, you can use the MP to add the latest patch for SAPUI5 (which are not a part of the SP imported) to the XML and import it in the XPRAS or TABIM_UPG phase of the upgrade. It will save a lot of time since it will shorten downtime dramatically and save the import of SAPUI5 patches which are required anyway after the upgrade. Many clients of ours will appreciate this change. Please take into consideration when designing the new SP of SUM 2. Indeed this is already implemented in SUM: objects that appear several times in the queue are only imported once, and the import uses the latest version of this object. Are you sure the same works with mime objects? So why SAP_UI import is so long? yes, sure. This only works if the GUID is identical, as the SUM can’t compare mime objects with different GUIDs. Hi all, I’m performing an HCM ECC 60 upgrade from EHP6 to EHP8, and I want to try the SUM 2.0. The process, only show mw the Phase: CHKTOOL/REQ_PRECHECK2_CHKTL, and at the end of this phase, the SUM process ends with a ” YOUR PROCEDURE IS COMPLETE ” message, I don’t have any other option after that. In attachment you can see my screenshot. Hi all, I’m performing an ERP_PRO upgrade from EHP7 to EHP8, and I want to try the SUM 2.0. During the upgrade I face the below please help. connectivity issue … I presume the system is available, and you have validated the DDIC user password, correct? I would try to find out more on the error in the log files, and create an incident, if required. Any update for me . hm, I was not of aware of that you are waiting for more input from my side. I asked you about general system availability, and provided the hint to create an incident. Sorry to say that I can’t provide more. 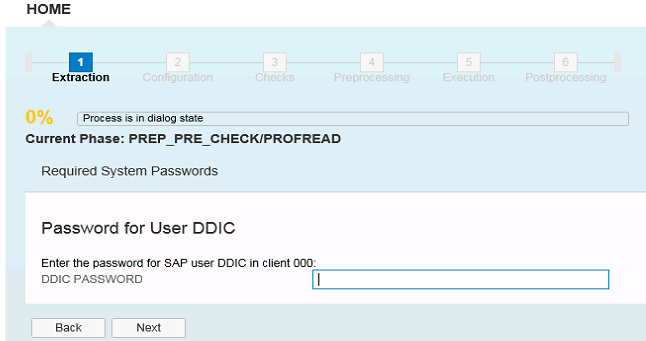 Sorry for not understanding you,I can access my system through SAP GUI on client 000 and client 900 with user name DDIC and password there is no problem ,but by using SUM I face an issue with ddic password in phase PREP_PRE_CHECK/PROFREAD during upgrade with Software Update Manager. 2 ETQ214 Phase was executed 3 times before. 1 ETQ206 Executing pre-phase DB specific actions 0/1. 1 ETQ200 Executing actual phase ‘PREP_PRE_CHECK/PROFREAD’. 4 ETQ399 Starting dialog ‘Passwords’ at 20171009162255. 4EETQ399 RFC login to system PRO ashost MASAPPRO.almansour.grp nr 00 gwhost MASAPPRO.almansour.grp gwservice sapgw00 failed with code 28 key : Unknown error in lower level library. 4 ETQ399 Repeat dialog since input validation failed. 2 ETQ214 Phase was executed 4 times before. 4 ETQ399 Starting dialog ‘Passwords’ at 20171010175315.
thank you for opening an incident, as this is an issue to be handled by support. Thank you for giving information about new SUM 2.0. Was curious to know if there are any performance specific improvements for DMO to reduce downtime of systems with large data footprint? e.g. improvement in row count (*) tasks , application table data migration or upgrade finalization phase specifically for DMO. no major improvements to mention concerning these points. For each new SP version, I publish a blog on the news with the SL Toolset, and this blog contains the major news for SUM as well. The blog for SL Toolset 1.0 SPS 21 is linked above, in the text. Thank you for this blog. Just one doubt which I don’t see anywhere in SAP forums on upgrades i.e. what would be the way to take our java stack to NW 7.5? We currently have a dual stack environment, which we are going to split and then upgrade both stacks to 7.5. For ABAP, we will be using SUM 2.0 as you have mentioned but for Java Stack, I understand we can only upgrade it to 7.4 using SUM 1.0. As your system is a Java stack (after the split), you use SUM 1.0. The restriction “7.50 or higher” is only valid for SUM 2.0, and for ABAP systems. We need to split the ERP (dual stack on NW7.01) then upgrade both ABAP and Java to NW 7.5 in parallel (They are in the same server after the split). Is it possible to run the both upgrade in parallel. If yes, which SUM tool to use for the upgrade and registration for the SAP host agent? after the split, the ABAP and the Java stacks are separated, and have to be handled separately. For the Java stack, you use SUM 1.0; for the ABAP stack targeting 7.50, you use SUM 2.0. Thanks Boris, so I can still run the parallel upgrade but just need to use a different SUM (1.0 for JAVA and 2.0 for ABAP) for registration to the SAP host agent and different url to start the SUM? thanks for following up, now I got your point, sorry: it is about two SUM running on one host, on two different systems. Although we only have one port 1129 (for HTTPS; 1128 for plain HTTP), the URL contains the SID of the respective system. The SAP Host Agent configuration files contain the mapping from the URL to the path where the SUM is located. This mapping includes placeholders for the SID. So a prerequisite is that both SUMs reside in the “usual” path: /usr/sap/<SID>/SUM. Otherwise the mapping will not work. Thank you for rephrasing the java stack part. Its clear now when I read it again 🙂 . I also have a doubt regarding upgrade of Java stack part. Is it mandatory to upgrade our java stack to NW 7.5 (from NW 7.4) , when we upgrade our ECC ABAP stack to NW 7.5 (EHP8) from NW 7.4 (EHP7)? Where can I check the dependency as now I have to upgrade ABAP and Java stack separately? my recommendation is to check SAP note 2200904 “Official Violation of Version Interoperability for Business Suite 7i2016”, and referenced notes therein. Is there a work aorund to this issue, as the SUM screen that it fails on does not allow the error to be ignored. SAPup> Process with PID 3393 terminated with status 59 at 20180220121337! Did you check or un-check the option on the fist dialog (on which you specify the location of the stack.xml)? I un-checked the option “Check archive authenticity” on the screen where the location of the where the location of stack.xml is specified – in the phase MOD_SELROADMAP/SELECT_ROADMAP. My download directory is I believe the default , which is /usr/sap/trans/EPS/download, so I did not get prompted with screen for the download location and the flag you mentioned above. if this is your first run with this SUM directory, and you do not see the dialog asking for the location of the stack.xml, then there is something wrong. You may try to reset the SUM run (followed by cleanup, and exit), then extract the SUM archive again, and start a new run. 76290 / 2018 Phase: PREP_INPUT_CHECK/EXTRACTKRN_PRE fails for screen shots – I will really appreciate and grateful if someone could look at this? thank you for creating an incident. Glad to see in the incident that the issue was resolved meanwhile. +++ Connecting to SAPup via port 12040. +++ Starting main SAPup process. SUM is started by the host agent at the first HTTP request from the browser. I’ve tried by different ways. Thanks Boris for providing the details on SUM 2.0 and also explaining the area where SUM 1.0 and SUM 2.0 can be used. Is there any other important info can be shared for SUM 2.0, if possible please share it. Question: We have a ECC 6.0 EHP4 Non-Unicode with Oracle 10. Can i use SUM 2.0 to migrate to EHP8 with Hana direct in one step?? Targeting systems based on 7.50 or higher (like EHP 8) requires the source system to be on Unicode already – so one step is not possible. thank for the info. Is it possible when the target release is based on 7.40 ?? (like EHP7). now I am not sure what the focus of your question is, and how much you have already checked the relevant sources of information (always listed on support.sap.com/sltoolset). that 1.0 HDB have to be used when system run on Hana,, in the same entry you mentioned that ext Kernel. We have all our Hana system on 7.49 Kernel and from this point the question to use the normal sum 1.0 for such system below 7.5 and java. in relation to ext we can only Imaging that if we’ve an oracle with ext kernel and want to migrate in on way to hana then to use the HDB version, but as i also now if we include also then 7.5 upgrade in this the 2.0 Version is the one. Yes, you will have to use SUM10HDB for your systems on SAP HANA database with products below SAP BASIS 7.50. Yes, you have to use SUM 2.0 in case the target product level of DMO is based on 7.50 or higher.